You will be given a reference e-book to read which has 257 pages And the test will be based on that e-book , you can take final test within 1 year of purchase. In essence, magazine writing is quite similar to the writings done by journalists. However, an expert and certified magazine writer can create write-ups that may also vary significantly from what the journalists who work in a daily newspaper would normally produce. Most of the time, magazine writing certification holders create pieces that are more feature-oriented. While there are magazine writers who focus on creating smaller stories, there are also those who are dedicated towards producing narrative or long-form write-ups. If you are one of those who wish to become a magazine writer, then it is important for you to take up a magazine writing course so your writing skills and talents can be honed. You have to make sure that you have enough passion in writing as this will allow you to move forward regardless of the challenges that you may face when practicing your career. As a magazine writer, you should be able to determine how you can get over the hump. This means that you should improve your skills in immediately solving the problems and difficulties that you may encounter when putting or writing the initial words on your paper. To help you create entertaining and informative articles and write-ups for a magazine, you should consider asking yourself who is your audience. Knowing your audience is a wise strategy if you want to successfully hurdle the difficulty of drafting the first words. It is also important for you to improve your skills in researching accurate information and facts. Being a magazine writer is a fun career so enrolling in a very reliable medical writing course to hone your skills and knowledge in this field is a wise move. One of your best choices is the magazine writing certification program offered by Brainmeasures. Brainmeasures is a reliable online certification company considering the fact that it continues to operate based on the strict guidelines and standards set by ISO and that all its programs are expertly and accurately created by professionals. The magazine writing certification program offered by Brainmeasures is a huge help in your attempt to improve your article writing skills and make these skills suitable for magazine writing. To gauge your skills in writing the most entertaining and informative articles for a magazine, Brainmeasures will require you to take its online writing exam. You are required to pass this exam as this will allow you to get your magazine writing certificate. 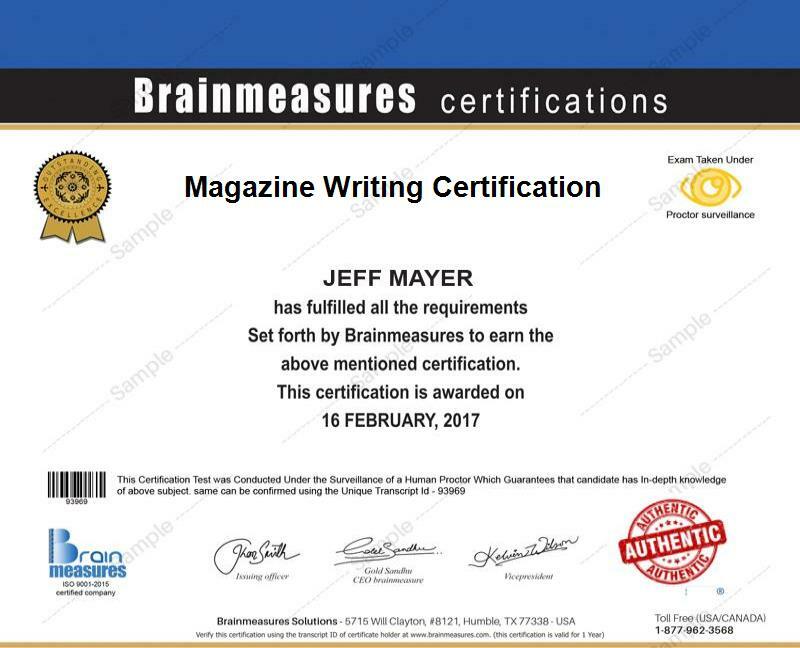 The magazine writing certification program that Brainmeasures offers to the public is intended for anyone who wishes to hone his magazine writing skills. You can expect this certification course to be suitable for you if you are planning to learn the most effective techniques that you can use in magazine writing. The course is also good for professional writers who are planning to dedicate their time, effort and attention in writing articles and stories for a magazine. As a magazine writing certification holder, you can expect your salary to become more stable. Your average annual earnings as a certified magazine writer can be expected to range from $32,000 to $60,000. If you work as a freelance writer, then your earnings could be around $0.01 to $2 per word. Gaining more experience in the field will allow you to earn more.